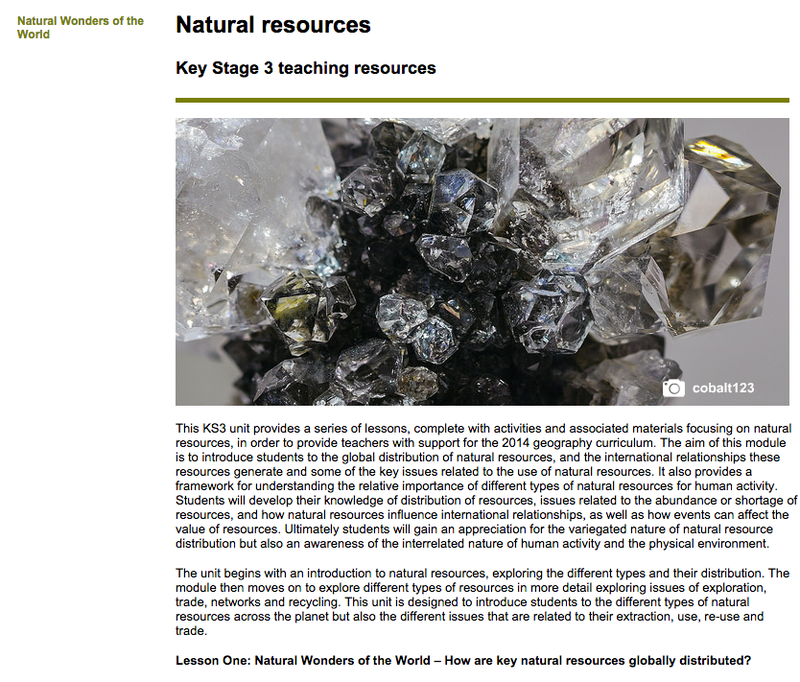 A new set of KS3 resources, written by Jennifer Ferreira has started to be added to the RGS-IBG website to support teaching about natural resources. This KS3 unit provides a series of lessons, complete with activities and associated materials focusing on natural resources, in order to provide teachers with support for the 2014 geography curriculum. The aim of this module is to introduce students to the global distribution of natural resources, and the international relationships these resources generate and some of the key issues related to the use of natural resources. It also provides a framework for understanding the relative importance of different types of natural resources for human activity. Students will develop their knowledge of distribution of resources, issues related to the abundance or shortage of resources, and how natural resources influence international relationships, as well as how events can affect the value of resources. Ultimately students will gain an appreciation for the variegated nature of natural resource distribution but also an awareness of the interrelated nature of human activity and the physical environment. The unit begins with an introduction to natural resources, exploring the different types and their distribution. The module then moves on to explore different types of resources in more detail exploring issues of exploration, trade, networks and recycling. This unit is designed to introduce students to the different types of natural resources across the planet but also the different issues that are related to their extraction, use, re-use and trade. Thanks for blogging about these. The full set is uploaded now.